Over the last few years, the zombies have come in full force as the juggernaut, The Walking Dead, averages nearly 20 million viewers with every passing episode, not to mention numerous popular film franchises like Resident Evil. Z Nation is Syfy's way of blatantly capitalizing on The Walking Dead's success. Instead of mimicking that other series' dramatic, brutal approach to the genre, Z Nation relishes in the fact that zombies are indeed fictional, opting for that signature Syfy channel cheese factor. The result is that Z Nation is, at times, actually a pretty fun show. The series starts off by giving us a birds' eye view of the world, showing barren wastelands of wreckage and disaster spread throughout the globe. 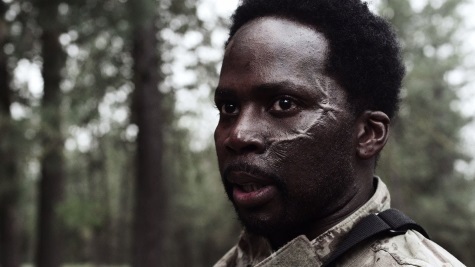 We close in on the last of a special ops unit running for their lives from a surprisingly spry group of zombies until they're whittled down to one lone member, Hammond (Lost's Harold Perrineau). He treks through a mostly abandoned prison, finding only a team of doctors holed up inside. Hammond is taken aback as to what he witnesses: the doctors performing mutative experiments on death row convicts. We flash forward 3 years -- we're even shown a title card reading "3 AZ", meaning "After Zombie" -- as we follow a small ragtag group led by a former sergeant in the National Guard, Charles Garnett (Tom Everett Scott). The group soon stumbles upon a much more worn Hammond, now traveling with a man named Murphy (Keith Allen). Looking for safety in numbers, Hammond explains his situation. Murphy is also known as "Patient Zero", a former convict who was experimented on and is the only known survivor of exposure to zombie bites. Hammond has been tasked with transporting Murphy to a safe zone in California, hoping to help create a vaccine to put a stop to the ZN virus. You can draw comparisons all day to the The Walking Dead, but honestly, these shows couldn't be any different in their approaches to the zombie subgenre. The Walking Dead takes itself very seriously with its storytelling, adopting an insanely slow pace at times. On the other hand, you have Z Nation, a show that prides itself on being incredibly ridiculous and insanely over the top. I mean, there is a scene where a group of zombies have managed to get themselves into a Viagra factory, gotten into those little blue pills, and are walking around sporting wood. It doesn't get any dumber than that, right? Wrong. That's just the tip of the iceberg, really. You also have the Zunami a tsunami of zombies, the zomnado a Zombie tornado in an homage to Syfy's Sharknado, and last and certainly least, "Citizen Z" (DJ Qualls), a character so inane that he actually ruins the show. Oh, and let's not forget that one character is slowly becoming GOD of the zombie apocalypse, which they realize after their saliva cures someone and gains psychic abilities. Yeah...actually, that concept is admittedly pretty awesome. 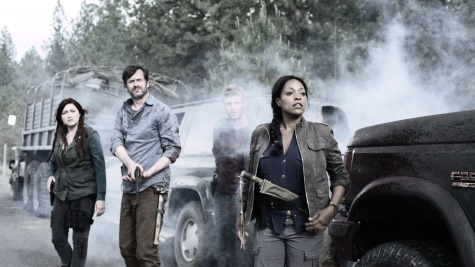 One thing that I feel that Z Nation really has going for it is the fun factor, which I've already touched on, but what hooked me about the show is its unpredictability. When I watch The Walking Dead, you can tell with the introduction of every new character if they're a red shirt or not, and this isn't exactly the case with this show. It's not afraid to take any risks. In the first half of the season, it manages to kill off several very key characters, and that's something I didn't see coming at all. Sadly, the creativity of the show kind of just ends there. + Several cool twists, with one taking place as early as the first episode. + There are a couple of good performances in the bunch, most memorably Tom Everett Scott as the badass sergeant of the group. Keith Allen is great as Murphy, and Kelly McGillis of Top Gun fame is appropriately terrifying when she pops up on screen. + Takes risks with its storytelling. - DJ Qualls should not be a thing. - Syfy channel tropes, cheesy effects, bad acting, and ridiculous dialogue. - At best, it's "junk food" TV. - Nothing is as bad as the Groundhog Day-inspired ninth episode. The God awful "Die Zombie Die...Again" brings the show to an abrupt halt. The visuals of Z Nation are solid enough. The color palette is inky, grayish, and dull to convey the bleak setting of the apocalypse. The presentation is noisy at times with noticeable grain, and that gives the show a grittier look. Overall, it's okay. The audio is much better here represented with a Dolby Digital 5.1 track. Throughout the quieter scenes, the dialogue is crisp and clear, while the mix amps up appropriately in the action sequences. There are no noticeable dropouts throughout the box set. Preparing the ZN Virus: Z Nation Concept and Development - Behind the scenes feature that showcases how the show was conceived and developed. Race for the Cure - A behind the scenes feature showing the making of the first season. Making of a Znado and More - A behind the scenes look at the making of the series' visual effects. Creating the Gore - A featurette delving into the creation of the zombies and gore. Music of the Apocalypse: A featurette that showcases the score of Z Nation. Z Kill Reel - A montage of all of the kills from season one. Is it a fun show? Yeah, I suppose, but at the end of the day, it's nothing more than another offering from Syfy. It doesn't hold up to any of the top tier television shows. Barely even mid tier, it's simply the junk food of the television world. The acting is pretty inconsistent, and the effects -- while not great -- are solid for Syfy. Granted, I don't watch a lot of their stuff, but it's the best I've seen from an original production of theirs in a while. At the end of the day, it achieves what it sets out to do: to be entertaining. My opinion is that its at least worth a look. Rent it.